When I’m sight-seeing I need regular stops to cool down/warm up, sit down and refuel. 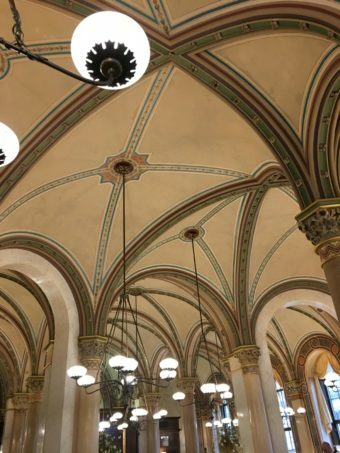 There’s no shortage of cafes in Vienna, and the most famous one is a large coffee house: Café Central on the Herrengasse in the Hofburg Quarter. The streets near the Hofburg are lined with palaces built by the nobility in their rush to live as close as possible to the Emperor. Coffee houses have existed in Vienna since the late 18th century. They reached their heyday in the late 19th century, when they served as key meeting points for the Vienna intellectual scene. Cliques of writers, politicians and scientists had their own favourite coffee houses where they would meet to share ideas and catch up on local news. Even nowadays each coffee house has its own unique atmosphere and attracts its own particular clientele. The Hawelka, for example, has a bohemian image and Landtmann attracts actors and theatregoers from the nearby Burgtheater. All the coffee houses are grand and charming in their own way, staffed by waiters in black waistcoats and bow ties. A coffee house is an experience in itself; it’s not somewhere to drop in on the way to somewhere else. You’re expected to linger. 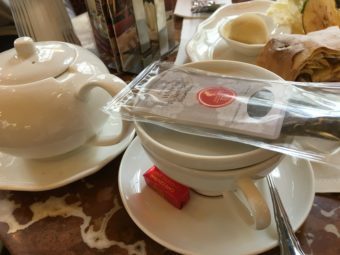 If you’re in Vienna at a cooler time of year you’ll be glad of the coat racks – it’s so relaxing not to have your jacket draped over the back of your chair in the style of Pret. 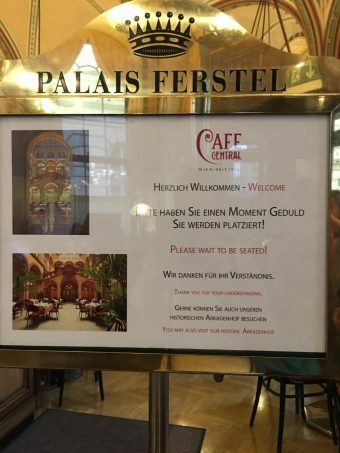 The Café Central turned out to be a handy place to relax after our visit to the Hofburg. 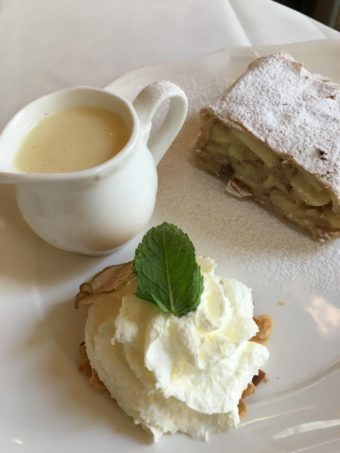 There’s a lot to see in at the Hofburg and so it’s a relief to sit down and take in the special ambiance in the Central. It’s a beautiful place. There’s usually a queue outside the door, but we were seated quickly on our first visit which was in the mid-afternoon. The first thing we noticed was the amazing ceiling! The Central was established in 1876 and used to be frequented by intellectuals and politicians such as Freud, Trotsky and Lenin, when it was probably more sombre. It’s a bright, lively place now, open from 7.30 am until 10 pm. 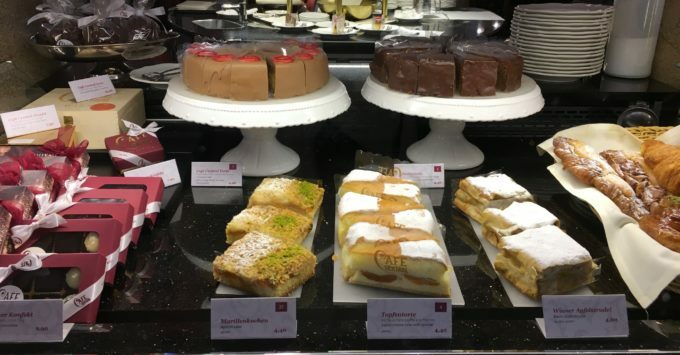 You can order traditional savoury dishes, coffee (of course), a huge choice of other drinks, and excellent cakes and pastries. The Vienna tourist board has posted interesting information about coffee houses and a large glossary of types of coffee here: www.virtualvienna.net/the-city-its-people/typical-viennese/viennese-coffee-house. You might want to consult the glossary before you choose your coffee, as there are over 20 different types. You’ll want to get it right as the waiters don’t have time to explain and the drinks aren’t cheap: around 5 euros for tea, coffee or hot chocolate. I chose white tea with peach, which I’d never heard of before and it was really delicate-tasting and refreshing. Everything is beautifully presented because after all this is a special occasion! 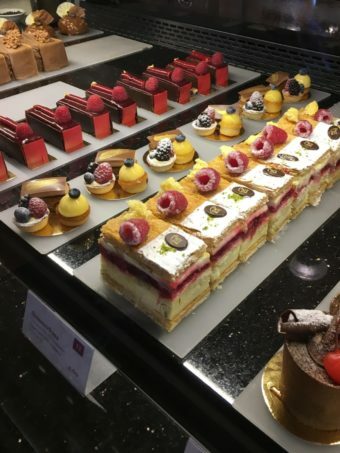 The choice of cakes, pastries and desserts is huge and they’re displayed in a vast cabinet. 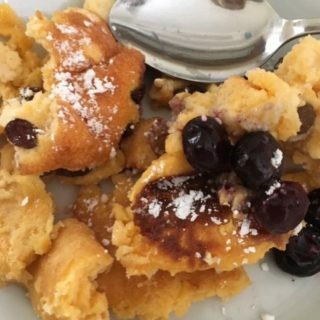 Apart from the apple strudel, my other Austrian favourites are Topfenstrudel (with a sweet curd cheese filling), and Kaiserschmarrn (torn pancake with icing sugar and plum sauce). There’s also a famous rich chocolate cake called Sachertorte, a dense texture but not overly sweet, with a thin apricot filling. It originates from the luxurious Sacher hotel in Vienna. We spent a while enjoying our elegant surroundings, and listening to the live piano music which starts at 5 pm. 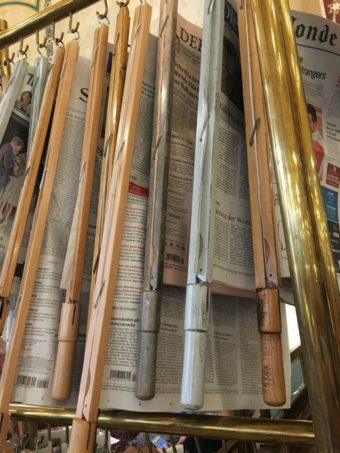 No time to read any of the newspapers provided on the special rack. On our final day we just had to go back to Café Central for lunch. Our flight back to London was in the evening, so we had good reason to tuck in to a “proper” lunch before the inevitable sandwich dinner. 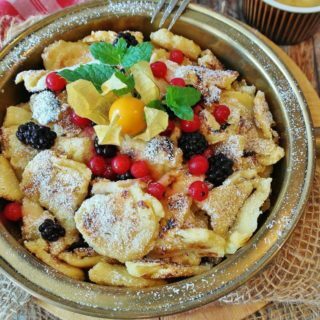 My husband and daughter both chose the Schnitzel – I think they both managed to squeeze in a Schnitzel every single day on our trip to Vienna. You can order smaller Schnitzels for kids, and pay about two thirds of the original price. 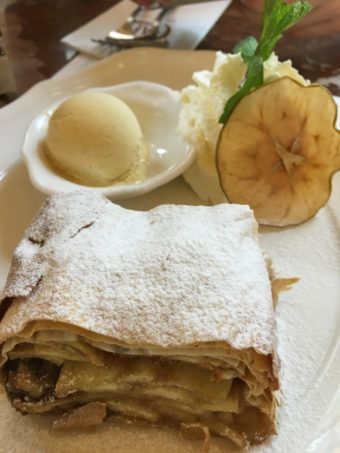 Of course you can also “share” strudels; just watch out for who gets the bigger spoon/who can scoop the fastest.